Would you make a good soil and plant scientist? Take our career test to find out how you match with this and over 800 other careers. What is a Soil and Plant Scientist? What is the workplace of a Soil and Plant Scientist like? A soil and plant scientist is someone who works in the agricultural field studying the different compositions of soil and the effects they have on plant life, crops, and the national food supply. Some soil and plant scientists work directly in the field, while others work in test kitchens developing new ways to process foods. 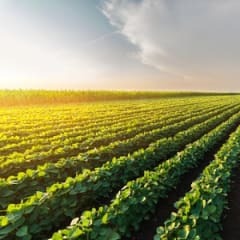 By studying the characteristics of yielding crops, how they grow in different soils, how to control pests, and the general chemical, biological, and physical makeup of the ground and plants, soil and plant scientists work to increase the national production of food as the need and population grows. Soil and plant scientists research the composition of soil to see how it affects plant growth. They study the breeding and cultivating of plants, as well as the yield that crops produce at the end of the growing season. They research the reaction of soil and crops to alternative methods of growing plants such as genetic modification. Scientists study the different characteristics of soil based on where it is located and the minerals that are in the soil, as well as what living organisms reside in the soil and how they impact production. Another job done by soil and plant scientists is investigating contamination in soil and groundwater, and finding ways to change the characteristics of the contaminated area – physically, chemically or biologically. Soil and plant scientists take their findings and give information to food growers regarding the ways they can best use their land, and what crops are best suited to be grown on the property. They survey land that has not been developed and aid in deciding whether it should become classified as conservation land. Soil and plant scientists supervise land conservation projects, as well as waste management programs for farms including composting. Scientists also alter soil types to grow different types of plants in environments where they may not naturally occur. In recent years, soil and plant scientists have had a very important role in determining the causes of bee diseases. Bees are crucial to the agricultural system, and with a rapid decline in bee activity, soil and plant scientists were called in to solve the mystery of their demise and to once again increase the production of pollen. Scientists must study the areas where both useful insects and pests can be found, and where they avoid so the infestation of injurious insects can be contained and kept away from crops. Are you suited to be a soil and plant scientist? Soil and plant scientists have distinct personalities. They tend to be investigative individuals, which means they’re intellectual, introspective, and inquisitive. They are curious, methodical, rational, analytical, and logical. Some of them are also realistic, meaning they’re independent, stable, persistent, genuine, practical, and thrifty. Does this sound like you? Take our free career test to find out if becoming a soil and plant scientist is right for you. The workplace of a plant and soil scientist will vary depending on the field they are employed in. Many spend regular hours (9-5) on the job working in laboratories or offices in the field of applied research. Soil and plant scientists that work with foods may spend their work hours in kitchens dedicated to testing and discovering new food processing methods. Scientists who work strictly with soil and crops will spend a great deal of time outside gathering samples for research on farms and other agricultural properties. The workplace is a team environment with many scientists working together to develop new techniques as well as improve existing products and techniques within their field.